This Sunday we celebrate the glory and the mystery of the Most Holy Trinity. A few weeks ago as I was teaching about the Sacrament of Marriage, I realized that I was missing something. We had read the chapter in our textbook, had completed a good class discussion and filled in these notes, but they needed more. With the current attack on marriage in pop culture, media, and politics, my 5th graders needed more depth to explain the meaning of marriage. As I planned the lesson, I thought about some of the things that I have taught and explained to students I have had in Youth Group over the years. I thought about how I could bring more of this lesson into a 5th grade classroom. I thought about my emphasis with the kids this year that they are all called to a Vocation, and those vocations are about love (the real kind) and service. And then I had a duh! moment. 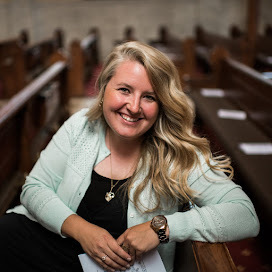 While trying to bring the lofty topics of vocation and marriage down to their level, I had unintentionally watered it down a bit. 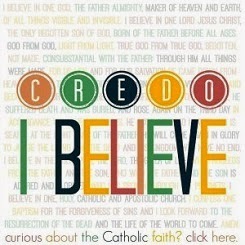 I didn't want to make it too confrontational, or introduce them to mis-truths about these Sacraments. And it hit me that I could use a simple but profound model that I have used with both teens and adults- it would work with ten-year-olds, too. A love is modeled after the Trinity. The complete gift of self between the Father and the Son yields the Holy Spirit. This union is founded on love- true communion- and we are made in the image and likeness of this model. That means that our Vocations are called to be life giving unions that bear fruit and are created by self-sacrificing love. Incredibly theological? Yes. A mystery that can't fully be understood this side of heaven? Yes. 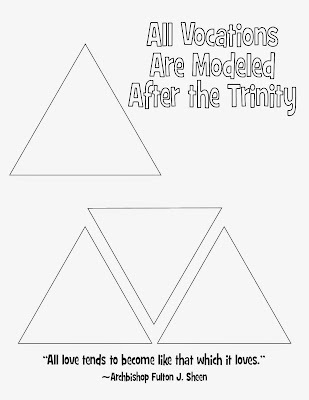 We then glued the four triangles onto a notebook page and added the title "All Vocations are Modeled After the Trinity." 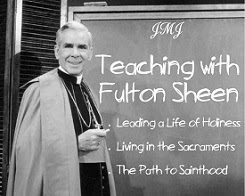 I also had them add the Fulton Sheen quote "All love tends to become like that which it loves." By using the model of the Trinity, I think I was able to show the kids that Vocations are not something that humans make up the rules for. It helps show why marriage is between one man and one woman. It explains why couples must be open to having children. It reminds us how real love really requires sacrifice. It was a great discussion, and a memorable teaching lesson for me. I hope to continually find ways to share great and glorious and mysterious truths in meaningful ways with the students in my classroom. If you don't want to do the cut-and-glue thing, you could also use these printable notes and have the same discussion. What do you think? Do you have any great resources or lessons about sharing the truths of marriage and vocations with kids? I'd love to hear about them! Great lesson! 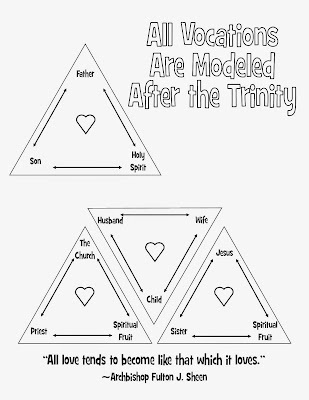 I pictured the sacrament of marriage a triangle too... but with the Holy Spirit as the "third part". Without that part, it's not really a sacrament or faith filled marriage. The difference between getting married at the court house vs. as a part of Mass. Knowing the world we live in and the class dynamics, I think this was a great way to present this sacrament! I know it could be very controversial and love that you presented it this way. Thanks, Whende! I like that analogy of marriage and a triangle, too- it shows that the closer a couple grows to God, the closer they grow to each other! Thanks for your encouragement! Oh, man! Flexibility is going to be your best friend in this adventure! :) Blessings as you continue to plan! What a great idea! I'm not always a diagram person, but sometimes a picture really is worth about a thousand words. I am always more inclined to write those thousand, yet the image is so much simpler. I love this SO much! Especially the part about how the love between the Father and Son is so strong that it is revealed through a 3rd person (Holy Spirit). I'm going to use this with my 3rd grade class and see how it goes. I really hate to water down the beautiful truths of our faith. This gives them such a great visual and although they won't fully understand (mystery) they'll see the connection with all the relationships. Those seeds will stay with them, and sprout when God is ready. I appreciate your work so very much. God Bless! I know! 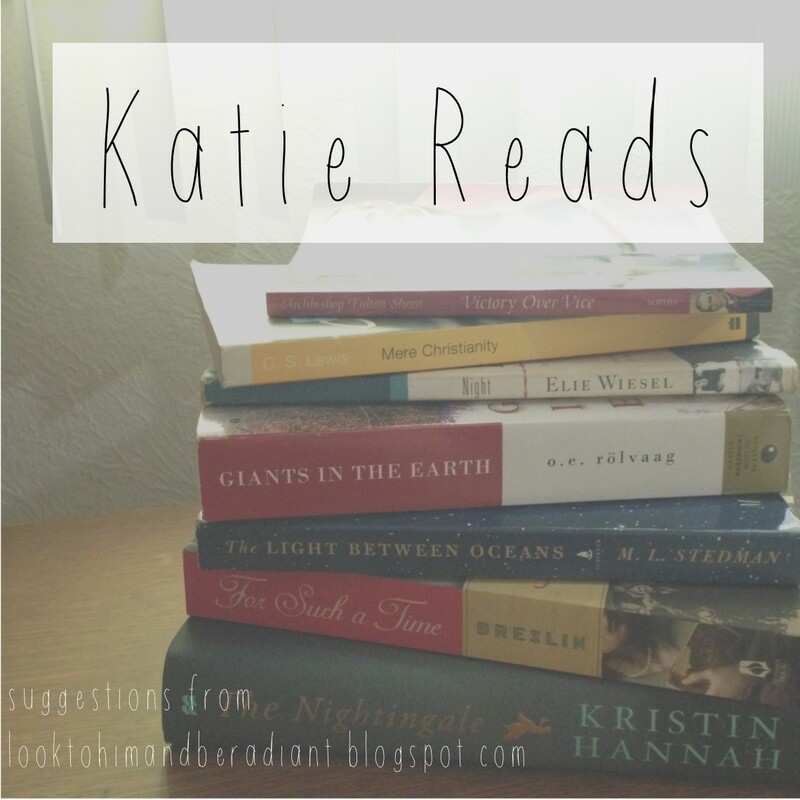 It's such a big big mystery for little minds (including mine!) to grasp, so this visual has been super helpful to try and explain it in a way that upholds the truth and doesn't water it down. Thanks for your comment, and blessings on you and your 3rd graders! Greetings. I just saw this. Question: How does the Holy Family, and it's connection to the Trinity, get portrayed in this way? Hi Stacy! I would say that the Holy Family fits right in with this model! Jesus, Mary, and Joseph share a mutual, self sacrificing, unifying love that bears fruit for the world. If you are being a little more specific and asking about Mary being the Mother of Jesus, I think that you also could use this model with Mary, the Holy Spirit, and Christ, showing that her yes and the overshadowing of the Holy Spirit brought about the Incarnation. Or you could picture Jesus, Mary, and Joseph at the three corners and the love between them being the Father and the Holy Spirit. Thanks for the quick reply. Is there a way to draw out the triangles?